Giveaway Hops are fun, don’t you think? You get to do something fun and visit other blogs participating and see what everyone else is giving away. I find the whole thing fascinating. A giveaway hop is when a group of bloggers/sites come together and they each host a giveaway on their site. There’s a theme and general fun and support for everyone involved. You must host a giveaway on your blog. You are responsible for obtaining the prize and any shipping costs. Your giveaway must include the Hop banner/graphic. It should also include a link to the Hop’s host site. If you want to do a mandatory entry, only one please. Also, no more than 5 option entries. Your post must be live by 9:01 A.M. EST on November 24th. The giveaway must be hop specific. As this is for Thanksgiving, it can be anything you’re thankful for in the book world. Examples include specific books, gift cards, etc. Please include ‘No Blog Left Behind’ in your title and in the post. 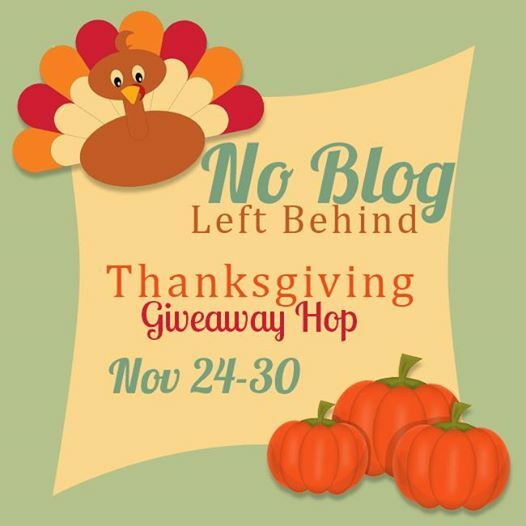 Welcome To The No Blog Left Behind Giveaway Hop! Please enter the link of your giveaway post, not your blog’s main URL. State US or INT at the end of your Blog Name so readers know where to enter. Make sure your post is set to go live on November 24 by 9:01AM EST.